Autograph collecting has boomed, but with the hobby's growth have come more pitfalls and more opportunities for collectors. 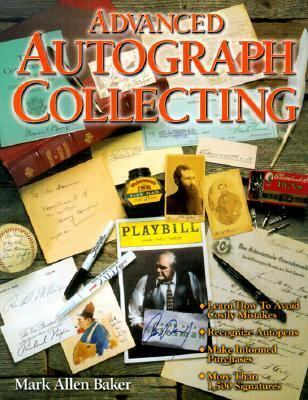 Finally here is a book that offers a logical roadmap to this exciting hobby: how to obtain the signatures you treasure most; how to identify fakes and forgeries; and how to avoid paying too much for autographs. Mark Allen Baker's latest autograph book covers all the priority collecting topics. He shares valuable tips on recognising autopens, the impact of technology on the rare document market, handling and caring for rare paper, and what you need to know to avoid costly mistakes. This information will help all collectors expand their knowledge. Some of the best autograph and manuscript hoaxes are detailed. There is also a chapter devoted to the sports memorabilia boom.Baker, Mark Allen is the author of 'Advanced Autograph Collecting - Mark Allen Allen Baker - Paperback' with ISBN 9780873416320 and ISBN 0873416325. Loading marketplace prices 9 copies from $2.64 How does the rental process work?